If you are looking for my Sew Mama Sew Giveaway Day giveaway, please go here. The giveaway will be open until Friday, May 25th at 5pm Pacific Time. I love my local Farmers' Market. A ten minute drive toward the ocean on a Sunday morning leads me to Alamitos Bay Marina where the market is held. With fabric shopping bags in hand and my hat on my head, I enjoy walking through the long row of vendors who sell fresh vegetables, fruits, honey, bread, cheeses, bison meat, fish and gorgeous cut flowers. It is such a pleasure to walk through and greet/chat with the vendors, try their samples (so fun to taste something new) and visit with friends that I run into. I always leave with strawberries, various greens, flatbread & humus (never miss this booth - they sell 10 different kinds of humus and all are spectacular), and then add in whatever is fresh, depending upon the season and what inspiration comes to mind. 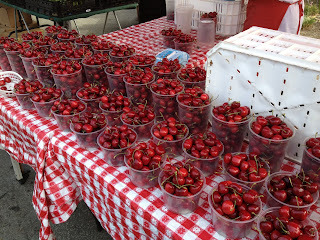 This past Sunday Bing Cherries made their debut and boy was it a big one. Numerous fruit vendors had them this week and what a wonderful pop of color they added to the market. Of course I couldn't resist and added them to my fabric bag. 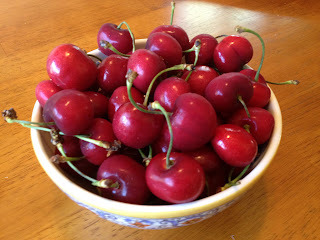 I have no formal recipe for you in regards to these wonderful Bing Cherries as I think they are best eaten straight out of a bowl while sitting on the front porch watching the wonders of life. Yesterday afternoon I had the pleasure of doing just that while watching my neighbor girls playing and having fun. Do you have a local Farmers' Market that you attend? Is there something in season right now that you are enjoying? Please share! I'm linking up with Debbie from A Quilter's Table with her Tuesday at the Table feature. Exciting News! 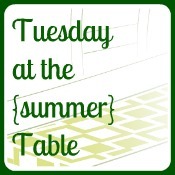 Debbie is hosting Tuesday at the Summer Table in June and I will definitely be participating all month long. Please visit her today to learn all about it and please, play along! Fresh cherries are definitely one of my favorite things about summer! Last year I bought about 40# from our semi-local Amish store and spent the next two days processing them. Thank goodness my mom was here to visit and help pit those babies. My kitchen looked a bit like a crime scene afterward with all the juice splatter! We have a local produce market with wonderful fresh fruits and veggies - one of the lucky things about living in So Cal! We have numerous markets in our area and one in particular we visit often in the summer ... always a treat to be sure! Thanks for linking up, Susan, & for the shout-out! Oh my gosh! I'd love to have a farmers' market like that! We do have one, and it's pretty nice though, but it typically has a dozen or 2 vendors at the most, but it's on Friday afternoons, and it's a great way for this small town to all get together and socialize too. We love cherries the same way, but we also love home made cherry ice cream!